A look at how interest rates and inflation affect the exchange rate – in short, higher interest rates tend to cause an appreciation in the exchange rate. Readers Question: In currency investing, would it be more profitable to invest in a country with high-interest rates and high inflation, or low to zero interest rates with low inflation? In other words, is the real interest rate more important than nominal? Other factors being equal, does it always mean that the currency of a country with higher real interest rate will strengthen over time compared to one with a lower real interest rate? Yes, the real interest rate is the most important factor. However, as well as the nominal interest rate, it is also important to look at the inflation rate. Higher inflation tends to lead to a depreciation in the value of a currency. With high inflation, goods become less competitive so demand falls relative to other countries with lower inflation rates. Ceteris paribus, it would be more advisable to invest in Singapore, which has a positive real interest rate of 1%. Why not invest in India, where you get an 8% interest rate? If you put your money in India, you would get a good interest rate of 8%, however, with inflation of 8%, you would expect the Rupee to devalue by 8% a year. In Singapore, you would get a lower nominal interest, but the Singapore currency would only depreciate by 4%. This is the same real interest rate as India. However, in this situation, it would be advisable to invest in UK pounds because a lower inflation rate suggests greater stability. Inflation of 8% in India suggests greater volatility. This volatility will discourage investors in India. The higher inflation is, the more volatile it tends to be. Investors may be concerned that inflation of 8% is starting to get out of control. 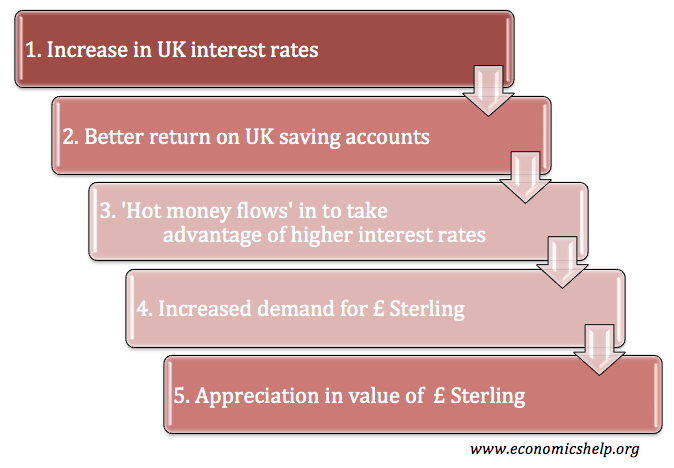 It is possible that, even if Indian interest rates increased to 9% (real interest rates of 1%), people would still prefer to invest in UK pounds. This is because although there is a lower real interest rate in the UK, there is a greater sense of stability. This is because in the current climate the real interest rate has become less important than the overall fear of debt default in the Eurozone. Therefore, there has been strong demand for the Pound, despite a negative real interest rate. Therefore, this shows that the real interest rates are only one factor out of several that can influence the exchange rate. ← Can Labour be blamed for the economic crisis? Just wondering why the demand for a currency (cash) increases as interest rates increase. Cash pays 0% interest. Even a savings account is fixed income instrument (or the underlying is). My thinking is that the demand for cash increases because you need to first obtain that cash in order to buy the fixed income securities that are denominated in that currency. Is that correct?